Today people are more health-conscious than ever. More people are eliminating junk foods, hitting the gym and trying to live healthier and more active lives. For some it’s about longevity, for others it has more to do with looking good on the outside. Whatever the reason, having a healthy body is scripturally sound and in line with God’s plan for His people. In the fast-paced world in which we live, it’s often too easy to hit up a drive-thru on the way to the next event, practice, meeting, etc. Once in a while is fine, but too often can be detrimental to overall health. With a little planning, simple but healthy meals can be made and enjoyed using fresh produce and lean meats. Remind your guests that since the body is God’s temple it should be nourished with healthy foods so it can perform at its best. Getting active doesn’t necessarily involve a gym membership. Exercise can be as simple as taking a walk around the block in the evening, playing a game of soccer in the front yard, or taking a bike ride on a local trail. Use the focus scripture to remind guests of the importance of keeping God’s temple in optimal shape through exercise and an active lifestyle. Life can be hectic with all the demands placed on us. Work deadlines loom, finances must be dealt with, home life can be complicated. It’s incredibly important to make time to do things that relieve stress. For some, exercise is a stress reliever. For others, relaxing with a good book and some hot tea is the best way to chill out after a stressful day. Tell guests to find some time to do some kind of stress-relieving activity when they feel themselves getting overwhelmed. It’s much easier to problem solve when the mind is clear and focused and stress-free. There is no need to buy expensive gym equipment in order to get in shape. This simple, but useful craft makes use of recycled materials like plastic bottles to create personal dumbbells. Simple supply the bottles, heavy duty duct tape and fillers like sand or rocks. A fitness journal can be a great way to keep track of meals and activities and stay accountable to yourself. Supply guests with notebooks or binders and the printable journal pages. Allow them to assemble the journals to best suit them. They can personalize the journal binders as well. These stress-relieving balls are super simple to make. Supply guest with colorful balloons and allow them to fill them with their choice of materials: Orbeez, rice, baking soda, etc. They can make multiples so they always have one on hand! This game makes fitness much more fun! Label a beach ball with different physical activities. Gather guests into a circle and pass the ball hot-potato-style around the circle as music plays. Then the music stops, the last person with the ball must pick the activity closest to their right thumb. The whole group performs the activity and then play continues. Divide guests into teams and give each team a bucket of cookies. The teams must slide the cookies across the room to a taped-off rectangle on the other side. The teams can knock out the cookies of the other team (give each team different cookies to differentiate). The first team with four cookies in the box wins. Bring in a guest speaker who specializes in diet/exercise. Have them do a demo of techniques, ideas for healthy living or recipe ideas. Include time for Q&A. Instead of goody bags full of candy and high-calorie treats, opt for a more fitness-friendly offering. Fill treat take-home bags with boxed raisins, mini pretzels, granola bars, carrot and celery sticks or string cheese. Living a healthy life with a healthy body and healthy spirit is important in the life of believers. It can be difficult to maintain good habits, but with practice and prayer it’s more than possible. 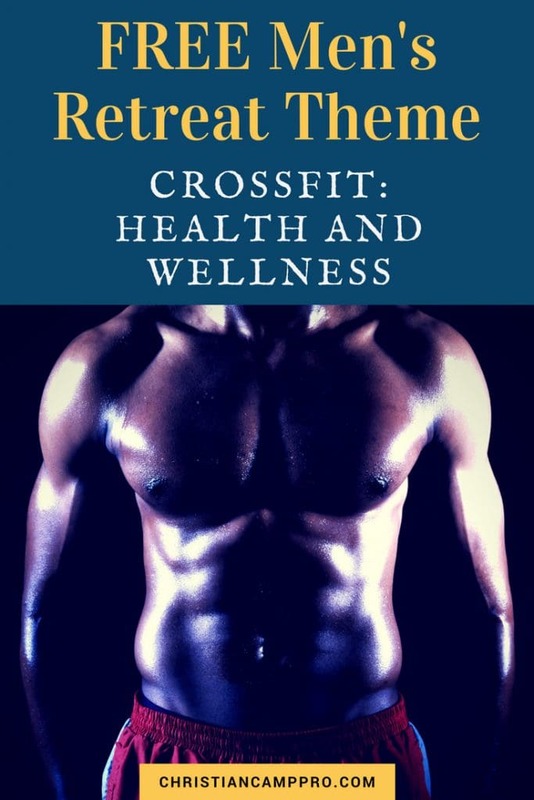 A CrossFit retreat can help men understand the relationship between a healthy physical life and a healthy spiritual life. It can give men the jump-start they need in living a life that is pleasing and useful to God and full of energy and vitality for them.